So you want to be a yardfarmer. Here is some essential reading to get you on your way. The first three are filled with essential tips on growing lots of food in a little yard, while the other two raise some of the challenges to be careful of. Growing food isn’t easy, as My Empire of Dirt reveals. And yardfarming may come in direct conflict with your neighbors’ love of their lawns–a cultural norm that is now deeply ingrained in American culture. Lawn People will help you understand that cultural norm and how to effectively challenge it. Happy reading! 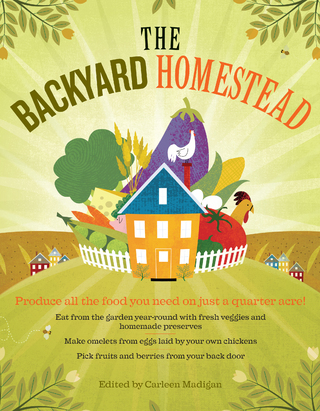 1) The Backyard Homestead is a great resource for any yardfarmer to get started. You will learn the basics of planting and caring for fruits and vegetables, the best growing seasons for each plant, and how to make your garden produce more and continue to thrive from year to year. There is also information in this book about raising meat and poultry, growing and harvesting grains, making beer and wine, and foraging in your community for edible wild plants. 2) The Urban Homestead is the go-to resource if you live in a city and have little space for yardfarming. This book will show you how to grow plants on your balcony or patio, set up gardens in public spaces, and keep chickens in an urban area. It has projects that will guide you in an easy to follow step-by-step manner and tips to help you be successful. 3) The Food Not Lawns project has a website and a book and both are excellent places to start learning about yardfarming. The book has practical knowledge to share on both farming (yards or larger lots) and urban gardening (if you have less space). 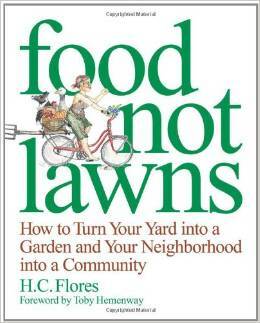 It also discusses the reasons behind the movement to grow food instead of having a lawn and tips on how to get your community involved. The project is very community oriented has ideas on organizing community meals and building garden play areas for and with children. 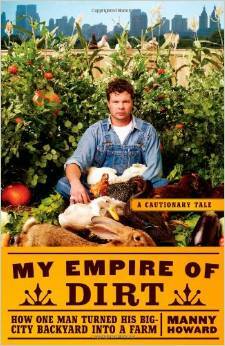 4) My Empire of Dirt is “A Cautionary Tale” about one man’s effort to convert his 800 square foot urban yard into a sufficiency farm. 5) Lawn People delves into the ecological impacts of the excessive chemical use behind lawn maintenance, and discusses the reasons behind the continued lawn upkeep and use of such chemicals despite the widespread knowledge of their toxicity.